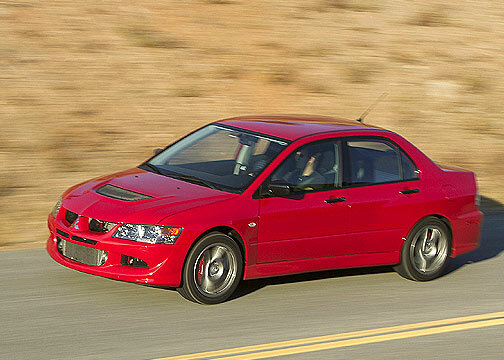 San Francisco: If you want world class performance and handling, but a Porsche 911 or Jaguar XK isn't in your budget, you should take a look at the Mitsubishi Lancer Evolution. While the Evo, as it is called in gearhead circles, is based on Mitsubishi's Lancer compact sedan, it is worlds apart after Mitsubishi tuners turned it into as serious sport car that is ready for the race or rally course. Indeed, the rally-bred Lancer Evolution was developed for competition in the hands of the best drivers. Fortunately, the Lancer Evolution VIII is civilized enough for everyday driving, at least for performance-minded owners. The heart of the Evolutions is the awesome 2.0-liter, double overhead camshaft (DOHC), 16-valve four cylinder engine. This turbocharged engine pumps out 271-horsepower at 6500 rpm and 273 lb-ft of torque at 3500 rpm. The turbocharger features a water spray enhanced air-to-air front-mounted intercooler The Evo engine is modified substantially to handle this tremendous power output. Only a five-speed transmission is available and has been proven in rally competition. Power is delivered to all four wheels via a full-time, AWD system with 50/50 viscous coupled center differential, front open-type differential and rear mechanical limited-slip differential. The EPA numbers for the Evolution are 18 mpg city and 26 mpg highway, quite remarkable for all the power available. The fuel tank holds 14 gallons. Besides neck-snapping acceleration and 0 to 60 mph in just over 5-seconds, the Evolution has almost unbelievable handling whether it is in a straight line up to the car's top speed of 157 mph or while cornering at high speeds on all types of road surfaces. Outstanding braking is provided by the ventilated BREMBO disc brakes on all four wheels. The Evolution rides on 17-inch ENKEI� light-weight alloy wheels shod with Yokohama ADVAN high-grip tires. The Evolution's body was stiffened immensely over the base Lancer, which has very good unit body construction to begin with. The Evo gets welded seams, thicker, reinforced suspension mounting points, and more substantial body member connections. The bottom line is a 160-percent improvement in flexural rigidity and a 200-percent increase torsional rigidity. It is easy to distinguish the Evo from the ordinary Lancers by the flared fenders and more aggressive front end that include large inlets to get more air to the intercooler. A pair of four-bulb headlights with HID composite low beams and projector-type high beams provides great nighttime illumination. For the ultimate racer look, there is an optional carbon fiber rear wing that slightly improves downforce over the rear axle, but only at very high speeds. The wing does hinder rearward visibility. Likewise, the interior is upgraded from regular Lancers. This includes a leather-covered, three-spoke MOMO� steering wheel and leather-covered shift knob. The complete Evo instrument panel includes a 170 mph speedometer plus a 9000-rpm tachometer, which are both illuminated by red lighting. A 140-watt, six-speaker AM/FM/CD stereo is standard on the Lancer Evolution VIII and a power moon roof is optional, as is a 315-amp seven-speaker Infinity AM/FM/CD Stereo system with trunk-mounted sub-woofer. Recaro front seats are standard fare. For more serious competition there is the Evolution RS. To keep weight down, both the air conditioning and stereo systems are deleted. Besides cutting weight by about a 100 pounds, the price is reduced by several thousand dollars too. The list price for the Evolution VIII is $30,574 while the RS version lists for $27,374.